The Nimble Referral Program allows registered Nimble users to earn account credit toward future Nimble account purchases by referring friends to become Nimble customers. Earn credit by sending your referral link to your friends and professional contacts. When they use your unique link to start a new Nimble subscription, a referral credit will automatically be applied to your account billing. When referrals subscribe to any Nimble plan, you’ll receive a $25 credit for each referred Nimble license the referral recipient adds for their first Nimble billing cycle. Note: This discount and credit is dependent on the number of licenses purchased at the time the subscription is created. Additional licenses added during future billing cycles do not count as referral credits. You may use your earned Nimble referral credits towards any purchase - your next subscription payment, add-on purchases for storage, contacts, additional licenses, or towards Nimble Prospector credit upgrades. Referred friends that have signed up using a valid referral link will receive a $25 discount for every Nimble license they add for their first billing cycle. 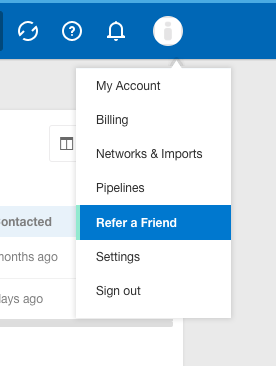 Select “Refer a friend” in the Nimble Settings dropdown menu to get your unique referral code and URL. Send invites over Twitter by selecting "Share on Social"
Send invites via email by selecting "Share via Email"
Nimble makes it easy to send invites with an included template for sharing your unique referral link over email or social media with your friends and colleagues. Feel free to modify the text to suit your audience. Want to share your code elsewhere? Click to copy your link to post anywhere you want. How are referral credits applied to sender accounts? Your earned referral credit will automatically be applied towards your next billing cycle. How do I receive credit for my referrals? Referrals must register through your unique link for a Nimble trial. If they sign up to become a paid Nimble subscriber, you will receive a $25 credit. For example, if they add 2 licenses for their first month, you will receive $50 in account credit and they will receive a $50 discount off their first month. How are my credits applied? Your earned referral credits will automatically be applied to your next Nimble billing cycle. If you wish to purchase an upgrade before your next billing date, you may apply the referral credit towards your account upgrade. You may use your referral credits for purchasing an add-on such as additional storage, contacts, users, or towards Nimble Prospector credit upgrades. Is there a limit to the amount of credit I receive? Do my credits expire? There is no limit to the amount of referral credits you may earn. Your credits will automatically be applied towards your next payment. What’s the best way to share? Spread the word using your unique link on social media or share via email using our email template. How do I track the amount of credit I have? Your referral credit will be tracked automatically for you each month and will be applied to the end of each billing cycle. Can I exchange my credits for cash? 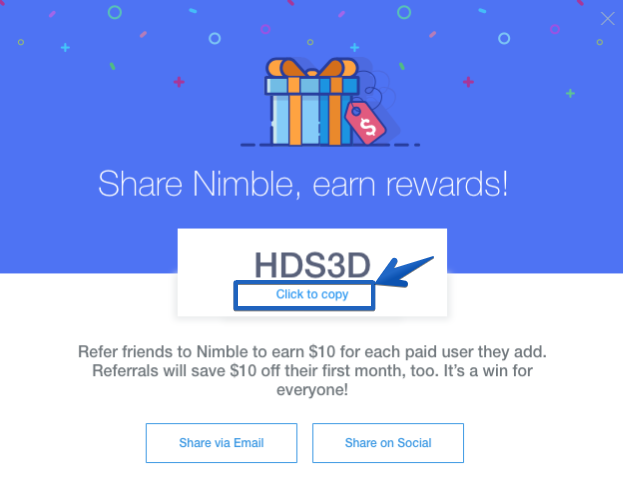 Nimble Referral Program credits are for promotional use only. You may not exchange your credits for cash. They are non-transferrable to other Nimble Accounts. What if I change our Nimble account administrator, do the credits transfer to the new administrator? Nimble referral credits stay with the company that earned them. Even if you change administrators, earned credits will remain with the account. What if one of my referrals cancels their license? Credits are earned as soon as your referral creates their subscription, therefore, it doesn’t matter if your invitee cancels their account, you do not lose any credit you earn on accounts you refer. Please reach out to Nimble Customer Care at care@nimble.com if you have any questions.